NetDimensions announces the availability of mobile assessments on NetDimensions Talent Slate on tablet devices and smartphones. NetDimensions (AIM: NETD; OTCQX: NETDY), a global provider of performance, knowledge, and learning management systems, today announced availability of mobile assessments on NetDimensions Talent Slate on tablets and smartphones. 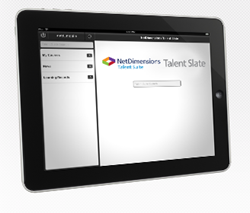 NetDimensions Talent Slate is a native mobile application on the iPad® and tablets for Android™, as well as the iPhone® and smartphones for Android. NetDimensions Talent Slate received the Brandon Hall Group Gold Award for Excellence in Learning Technology in 2013 for Best Advance in Performance Support Technology. "Mobile supervisor assessments are addressing important performance management needs in a number of industries. We have seen use cases among our clients involving bedside competency assessments in healthcare, observation checklists in oil & gas, or recurrent flight crew training in aviation." 1. Search-based navigation. NetDimensions Talent Slate enables users to navigate all the content and information stored in the NetDimensions Talent Suite via an intuitive search-based interface that accesses news, courses, reference materials, competencies, exams, training records, and other learning or talent-related information and knowledge assets. 2. Online & offline use. Search results and assessments from the NetDimensions Talent Suite are always available online and can also be tagged for offline use. This means that operations can be completed offline at the point of performance and smart synchronisation enables SCORM or assessment results to be uploaded into the NetDimensions Talent Suite when Internet connectivity becomes available. 3. Branding and personalisation. NetDimensions Talent Slate is highly configurable so that mobile screens can be branded according to different guidelines and look-and-feel options specific to each organisation. 4. Supervisor assessments. Supervisor assessments enable competency or knowledge assessments to be performed on the mobile device and results to be automatically synchronised with NetDimensions Talent Suite. Mobile assessments enable supervisors to evaluate employee performance in real time and while on the job. With smart synchronisation, NetDimensions Talent Suite remains the single system of record regardless of where assessments are completed. NetDimensions will be hosting a webinar to highlight the latest NetDimensions Talent Slate release on July 17th. You may register for this webinar at http://bit.ly/demohours. Established in 1999, NetDimensions (AIM: NETD; OTCQX: NETDY) is a global provider of performance, knowledge and learning management solutions. NetDimensions provides companies, government agencies and other organisations with talent management solutions to personalise learning, share knowledge, enhance performance, foster collaboration and manage compliance programmes for employees, customers, partners, and suppliers. Recognised as one of the talent management industry's top-rated technology suppliers, NetDimensions has been chosen by leading organisations worldwide including ING, Cathay Pacific, Hunter Douglas, Chicago Police Department, Geely Automotive, Fugro Group and Fresenius Medical Care. NetDimensions is ISO 9001 certified and NetDimensions hosted services are ISO 27001 certified. For more information, visit http://www.NetDimensions.co.uk or follow @netdimensions on Twitter.